Now Available: The FuMPFest 2017 Live 2-CD Set! 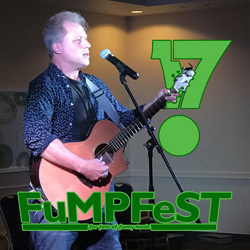 FuMPFest 2017 was an amazing event featuring performances by Henry Phillips, Carla Ulbrich, Peter Wildman, The Reformed Whores, the great Luke Ski, Worm Quartet, and many more amazing acts. And now you can relive the madness with the FuMPFest 2017 Live 2-CD set. This collection of live recordings from FuMPFest 2017 features 51 tracks recorded directly off the sound board for optimal sound quality. That's over two hours of live music and comedy from the event. If you weren't able to attend FuMPFest 2017 this collection will allow you to experience some of the fun. This collection is being sold as a fundraiser to help support the convention. All proceeds from the sales of this CD and digital download will go towards producing FuMPFest 2018 and making it the best convention it can possibly be. Pick up your copy today and help support the convention! Relive the madness. Support the event. Enjoy some great music and comedy.